Picture this: LeBron James and Steph Curry are NBA All-Star Game team captains. For the first time, the midseason game won't pit the Eastern Conference vs. the Western Conference. Instead, James and Curry will assemble their squads like a playground pickup game. Except this player pool is the stuff of dreams. Commissioner Adam Silver comes to the podium: "With the first pick in the All-Star draft, LeBron James picks..."
But it didn't happen that way. In an exclusive interview with CNNMoney, Silver explained why they held off. In the age of reality TV, an All-Star draft led by its two biggest superstars seems perfect for prime-time. But the NBA held its first All-Star draft via a conference call. "We made this major format change to the All-Star Game this year," Silver said. "Someone said, 'Should we televise it in the first year?' There was a sense from the players that 'Why don't we hold off on doing that. Let's see if the format works.'" Silver said he understood that caution, despite his background as the former head of NBA Entertainment. "I agreed, it could be very embarrassing even though they're all stars," he said. "Even among the greatest, to be the last picked among the greatest may be slightly embarrassing to some of the players." He noted that the players had conflicting views, but hinted at future television plans for the draft. 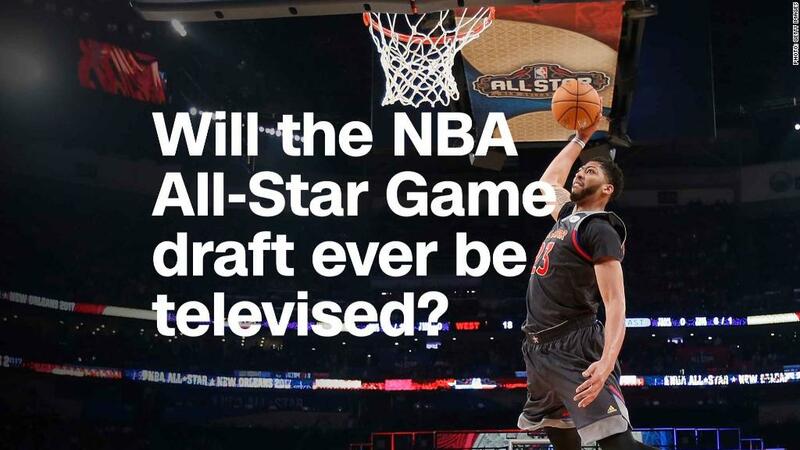 The All-Star Game airs on TNT, which like CNN is owned by Turner. "I thought Steph Curry said it the best. He said, 'Let's see if we can get this format off the ground. And if it's working and then we'll have something else for people to look forward to next year. We'll have a televised draft,'" Silver said. Making the draft public and embracing the spectacle would also play well on social media -- an area where the NBA has dominated over other leagues. "It was a decision many years ago that we should embrace social media," he said. "Not just other leagues but other intellectual property holders took a different view, which was to create more of a so-called 'walled garden' and say that the only way you're going to get our content is through paying for it or coming through our particular site." The NBA saw social media's potential as a marketing tool, according to Silver. Early on, it worked with platforms like Facebook, Twitter and YouTube to get NBA highlights and content to those large audiences. The goal: increase reach and exposure. Among the four biggest sports leagues, the NBA has the largest following across Facebook, Twitter, YouTube and Instagram. The NBA also worked directly with players to help them build their online personalities.